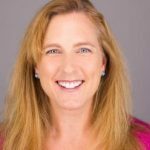 My name is Heather McCollum, and I have an obsession… with the British Baking Show. During Season 3, one of the technical challenges was a Spanische Windtorte, given to the contestants by Mary Berry. The creation is an Austrian dessert made of rings of meringue with whipped cream and berries in the middle. Wikipedia calls it “one of the most complex to create,” which reminds me that the internet is not always accurate. 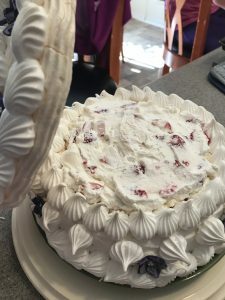 Yes, looking at it might make you think it is complex and way out of your baking comfort zone, but in reality, it is not very difficult to make. 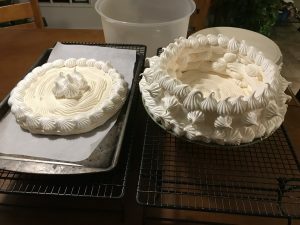 So, if you, like me, have someone in your life who loves meringue and want to impress the heck out of them, follow along. I’ll walk you safely through it. Have I lost you already?! But really – it’s not too hard. I’ll hold your hand through it. Little flowers to place on top for decoration. The bakers on the show had to make their own flowers out of fondant, but I bought mine at my local craft store. But you can go right ahead and make your own. I’m sure there’s a YouTube video on it. Line 3 cookie sheets with parchment paper (cut it out to fit just right). Draw five 8-inch diameter circles on the curling up side of the paper with a pencil. Turn the paper over on the cookie sheet (you don’t want to pipe meringue onto the pencil). You can still see the circles through the paper, and the paper won’t curl up on you. Preheat oven to 248 degrees (that’s what it says, but you can do 250 degrees if 248 messes with your OCD). Break the eggs for the French meringue into a bowl, making sure to get out ALL the yolk. Put egg whites and cream of tartar into a spotlessly clean mixing bowl and whisk with an electric beater on high speed until whites form stiff peaks. Add the sugar, a tablespoon at a time while whisking to make a thick, glossy meringue. Spoon 2/3 of the mixture into a piping bag with the plain nozzle attached. (It is sticky, but it’s going to be okay). Pipe a thick ring just inside the pencil mark of one of the circles on the baking sheet. Continue piping in a spiral inward until the entire circle is filled in. Repeat with a second circle (but NOT all of them). These are the base and the lid of the cake. If you are making your own fondant flowers, this would be a good time to do it. 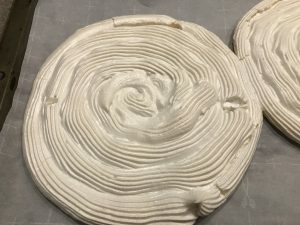 When the meringues are dry and cool, gently slide 1 of the filled-in circles onto the heatproof serving plate (this is what you will be serving it on so choose wisely). Spoon the remaining meringue into a piping bag (I kept mine in the refrigerator while baking, including the piping bag with tip). Pipe about 8 blobs of wet meringue onto the edge of the base circle (to act as glue), and place one of the meringue hoops on top, pressing down gently. 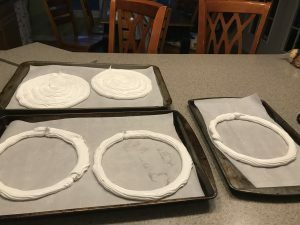 Repeat with the other two meringue hoops to build the cake walls. Pipe the remaining French meringue around the sides in the cracks of the hoops. Use a spatula to smooth the sides around to look like a cake on the outside. Bake on the serving plate for 45 minutes. Remove from oven and cool. 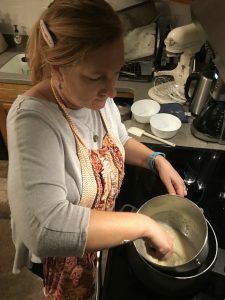 Separate your 4 Swiss meringue eggs (get the yolk out) and put them and the sugar into the large mixing bowl (no cream of tartar in this one) and whisk by hand until the sugar dissolves and the mixture reaches 158 degrees F on the candy thermometer. I watched mine very carefully and stopped as soon as it reached the 158 mark. Be careful while whisking around the thermometer. Remove from heat and whisk with the electric mixer until the meringue is cool and stiff. Spoon into a fresh piping bag fitted with a large star tip. Pipe a pretty border around the base edge and the middle of the walls going around. Also decorate the filled-in “lid” of the cake (which has been sitting off neglected while the rest of the cake baked again). Bake both the cake and the lid another 30 minutes on 248 degrees F. Remove from oven and cool. Make the filling. Whip the cream and powdered sugar together until soft peaks form when the whisk is removed. Whisk in the orange blossom water and then gently fold in the berries by hand. Spoon into the cooled meringue cake shell. Top with the meringue lid. Decorate with the flowers. I used tiny dabs of store-bought icing in a tube as glue. The recipe says to use meringue, but then you don’t bake it again, and I don’t like to use raw eggs. Okay, writing it all out… it does feel like a lot. But when I was doing it, it was much easier than I’d thought it would be. The key is to give yourself time and have a back up plan. I had a frozen Pepperidge Farm cake in the wings if this went kablooey. 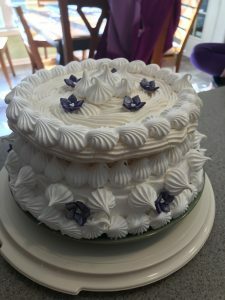 But it turned out fabulous, and my mother was awed by my meringue-whipping ability – LOL! If you give it a try, let me know how it goes. For my first time making it, I was amazed at how easy it truly was. So, don’t believe everything you read online! I’m looking at you Wikipedia! 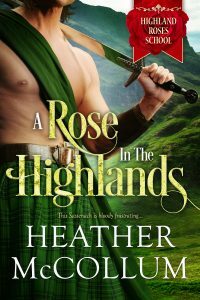 Grab A Rose in the Highlands by Heather McCollum for just 99¢!